A group of students and professors from Dalhousie will have the opportunity to participate in a real space mission through a new Canadian Space Agency (CSA) national student space initiative. Friday afternoon (May 4), at an event hosted by the University of Manitoba, CSA astronaut Jenni Sidey announced the 15 teams made up of 37 different organizations that will take part in the CSA’s Canadian CubeSat Project. 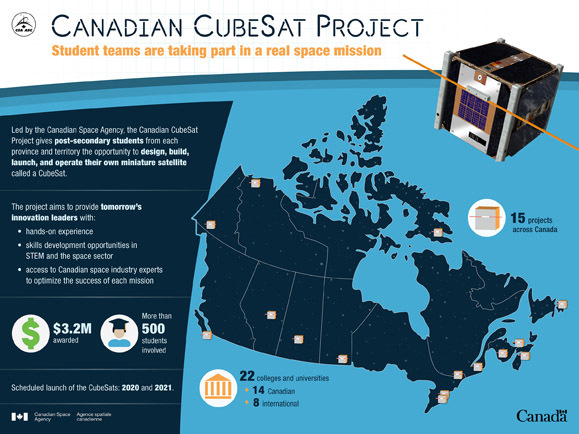 The Canadian CubeSat Project will provide students with the opportunity to gain science and engineering expertise as well as valuable experience in project management, leadership and communications by building a tiny cube shaped satellite destined for space. As a participant, Dalhousie will receive $200,000 in funding from this initiative. The research team, comprised of a group of experts from the Faculties of Engineering and Science, will be led by Kevin Plucknett, associate dean of research for the Faculty of Engineering, and Zhizhang Chen, head of the Department of Electrical and Computer Engineering. Dr. Plucknett and Dr. Chen’s team will test a new CubeSat frame made of lightweight metal alloys to enable better space navigation capabilities, and determine the effectiveness of onboard solar energy and battery storage technology to power a stabilization wheel that will better control the position of the satellite’s instruments. “This is an exciting opportunity for the students and professors at Dalhousie to gain valuable experience in space science and engineering, and we are extremely grateful to the Canadian Space Agency for providing the financial support,” says Dr. Plucknett. Throughout the project, CSA experts will guide the professors and students to make their mission a success. Once tested and ready for space, the 15 CubeSats (which measure 10 cm cubed) will be launched to and deployed from the International Space Station in 2020–2021. For more information about the Canadian CubeSat Project, visit the Canadian Space Agency website.